The Best Picture winner in 1964, Warner Bros.' and director George Cukor's My Fair Lady, was about the transformative training of a rough-speaking flower girl into a lady. The enchanting musical had run for many years on the stage (in both NYC and London). Rex Harrison was called upon to bring his marvelous characterization of perfectionist Svengali phonetics Professor Higgins to the screen. My Fair Lady emerged as the overall winner with eight Oscars: Best Picture, Best Actor, Best Director, Best Adapted Musical Score, Best Costume Design, Best Cinematography, Best Art Direction, and Best Sound. It was Warner Bros.' first long-overdue Best Picture Oscar win since Casablanca (1943), 21 years earlier. Its win involved an upset and turnaround, however. British-born unknown screen star Julie Andrews, long-time Broadway star in Lerner and Loewe's musical version of George Bernard Shaw's Pygmalion, did not appear in the Warner Bros. film version. 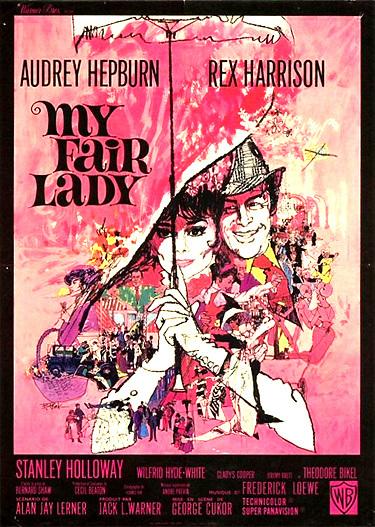 Andrews was replaced in the lead starring role of cockney flower girl Eliza Doolittle by non-singing film star Audrey Hepburn (whose singing voice was dubbed by Marni Nixon - a voice also used for Deborah Kerr in The King and I (1956) and for the un-nominated Natalie Wood in West Side Story (1961)). While Hepburn wasn't nominated for a Best Actress award for her role, Julie Andrews was cast in the title role (in her debut film) and nominated as Best Actress for Disney's live-action and cartoon blend and Robert Stevenson's director-nominated Mary Poppins, as a no-nonsense adventurous nanny. This popular film condensed several Poppins books by P. L. Travers and told the story of an English nanny who takes charge of the unsettled household of a proper London banker. My Fair Lady experienced serious rivalry and contention with the sugary Mary Poppins. [Note: The two musicals nominated for Best Picture had ulie Andrews in common.] 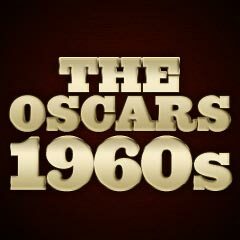 Each film had an impressive number of nominations: Mary Poppins had 13 and My Fair Lady had 12. Mary Poppins ended up with five Oscar wins: Best Actress (Julie Andrews), Best Original Song ("Chim, Chim Cher-ee"), Best Music Score (substantially Original), Best Film Editing, and Best Visual Effects. The winner of the Best Actor award was Rex Harrison re-creating his Broadway role as crusty, crisp-speaking, and irascible linguistics Professor Henry Higgins who 'talk-sings' his way through musical numbers and lyrics in My Fair Lady. His goal in the film is to win the wager that he can turn Cockney guttersnipe flowergirl Eliza Doolittle (Hepburn) into a lady. [This was Harrison's second and last Oscar nomination - he had been nominated the previous year for playing Caesar in Cleopatra. He had been in distinguished, yet un-nominated films including Major Barbara (1941), Blithe Spirit (1945), Anna and the King of Siam (1946), The Ghost and Mrs. Muir (1947), The Foxes of Harrow (1947), and Unfaithfully Yours (1948).] His win set the stage for his appearance as the kindly English veterinarian in Dr. Doolittle (1967). Ironically, Julie Andrews (Rex Harrison's 'fair lady' on Broadway for more than three years in a role she had originated on stage) won the Best Actress award in her debut film - in the title role of Mary Poppins as the 1910 magical, flying English nanny Mary (who travels through the air with an opened umbrella) from P. L. Travers' classic children's books. She performed her own songs in the film, in contrast to Hepburn's role in My Fair Lady. [It was Andrews' first nomination and sole win among three career nominations. She would be nominated the next year for playing another governess in The Sound of Music (1965), and later for Victor/Victoria (1982)]. The Best Supporting Actress winner was French-Russian Lila Kedrova (with her sole nomination in her first English-language film) as aging, disreputable French courtesan Mme. Hortense facing destitution in Zorba the Greek. One of the most obvious, but explainable omissions in the nominees of the year was Audrey Hepburn as Eliza Doolittle in the Oscar-sweeping My Fair Lady. For one thing, her singing performance was dubbed by Marni Nixon, and Hepburn's casting replaced Julie Andrews - the popular stage actress from the original play. And From Russia With Love (1963), (premiering in London in late 1963 but opening in the US in 1964) and one of the best in the James Bond series, was denied a nomination for its director Terence Young and for its lead action figure Sean Connery as agent 007. Director Guy Hamilton's Goldfinger won the Best Sound Effects Oscar for its sole nomination. The four-time nominated Night of the Iguana lacked a Best Picture nomination, and there were two entirely overlooked films: Joseph Losey's ground-breaking film The Servant (with Dirk Bogarde as Hugo Barrett), and Blake Edwards' comedy A Shot in the Dark (with another memorable performance by Peter Sellers). Peter Sellers was also un-nominated for his role as the title character, an eccentric concert pianist, in The World of Henry Orient. In addition, all of these performances were bypassed in 1964! - David Tomlinson as Mr. Banks in the oft-nominated Mary Poppins, Tony Randall's multi-faceted roles in 7 Faces of Dr. Lao, Joan Crawford as an aging, suspected ax-murderer in Strait-Jacket, Sean Connery as James Bond in the third film of the series - Goldfinger, Wilfrid Brambell as Paul McCartney's "clean old man" grandfather in A Hard Day's Night, and Peter Sellers as inept Inspector Jacques Clouseau in the first of Blake Edwards' highly successful series The Pink Panther.